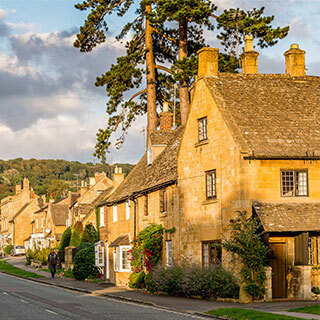 On a full-day tour of the Northern Cotswolds, we would start by visiting a few of the beautiful villages, including Broadway, Chipping Campden and Blockley. It’s then a short drive to Dovers Hill, a local landmark, where it’s possible to see for over 60 miles on a clear day. 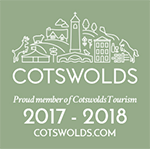 From Dovers Hill, we then make our way to Broadway Tower – an 18th Century ‘Folly’ located on the second highest point on the Cotswold escarpment, with a colourful and fascinating history from World Wars to the Arts and Crafts movement. In the afternoon we’ll head south of the region, towards the charming villages of Stanton (a place where its old-worldly architecture will make you feel like you’ve gone back 400 years in time) and Stanway, with its fine 17th Century Hall and host to the worlds tallest gravity-fed fountain. After lunch at a traditional 16th Century country inn (an opportunity to sample local food, cider and ales), we will drive east from Winchcombe; an old Saxon town and home to Sudeley Castle (where Catherine Parr rests in St Mary’s Chapel), and continue on to the ‘Romantic Road’ which takes us through spectacular countryside towards Bourton-on-the-Water (also known as ‘Little Venice’), The Slaughters (from the old English ‘Slohtre’, meaning ‘Muddy Place’) and onto Stow-on-the-Wold. 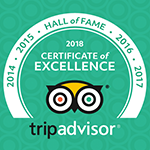 During the tour, we ensure that you also visit those ‘off-the-beaten-track’ locations which can often be missed if not familiar with the region. There will also be plenty of time to stop off for those important photo opportunities, as we cruise around the various locations. Excellent, informative, and oh… they put the “personal” in personality!! 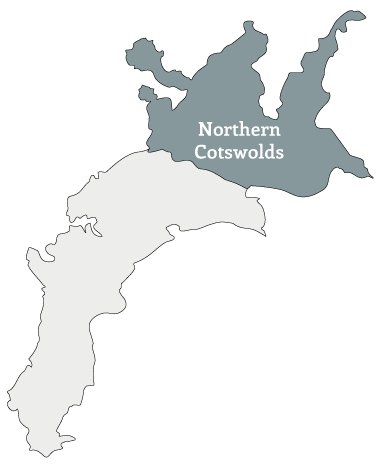 My daughter, my travel buddy girlfriend and I booked this bucket list experience hoping we could get a feel for the Cotswold since we didn’t have time to stay for a few days while on our London holiday. We didn’t want to do a bus trip and wha lah… we found CJP. My heavens… the beautiful countryside and narrative whilst touring. It brought the Cotswold to life so much so that I have not stopped talking about it. 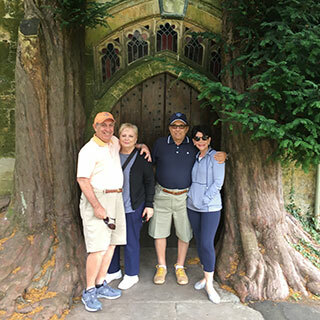 Broadway Tower, Hailes Church, and the manor houses we saw during our stops in Chipping Camden, Broadway, Stanton, Stanway and the Slaughters……why, this is a Rick Steves suggestion exclusive!!!! I loved stopping along the road to watch the Cricket games, the scenic beauty or just the beautiful sheep grazing. It was a full day with a wonderful host. It made this one of our memorable England holidays! You said we would enjoy it. That word doesn’t even begin to describe this experience. We will be back! A fine, wide high street–once a coaching inn village–Broadway is now bordered by manicured greens and lined with chocolate-box shops and cottages, and was once a retreat and hub for a colony of artists such as William Morris. 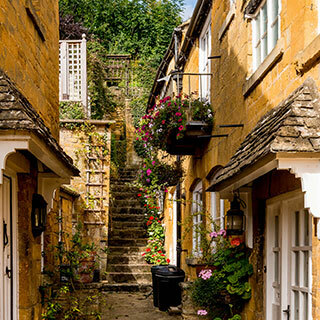 Broadway is often referred to as ‘The Jewel of the Cotswolds’ with its delightful high street, art galleries, boutiques, churches and museums. Sitting above the village on the second-highest point in the Cotswolds is also Broadway Tower, a not-to-miss 18th Century folly. Two ‘picture postcard’ villages – Upper and Lower Slaughter – which lie less than a mile apart, nestled along the sides of the crystal clear waters of the River Eye, with low miniature footbridges. As well as several manor houses (now luxury hotels) the Slaughters also has a 16th Century dovecote and a 19th Century water mill. 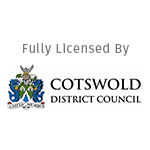 Stow-on-the-Wold was once home to one of the most thriving woollen markets in the country. Enjoy a stroll around the boutiques, art galleries, antique shops and town square. Also worth a visit is St Edward’s church, where the great yew trees by the north door are said to have inspired the Doors of Durin (entrance to Moria) in J R R Tolkein’s Lord of the Rings. The beautiful, unspoilt village of Blockley was once centre of the silk industry in the 18th and 19th Centuries and with the power of its mills, also enabled the village to be one of the first with electricity around 1885. 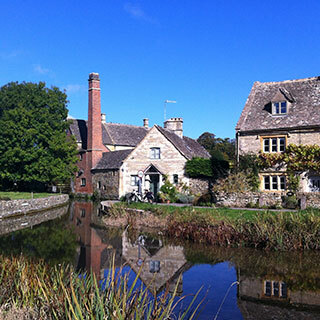 Recently used as the film set for the popular TV series Father Brown. Sample/Start price – from £475.00 per day for vehicle and private guide with a local collection/drop-off point.